Making dinner after my volunteer shift at the YMCA usually results in us eating extremely late. This week I lucked out and got to use my birthday as an excuse to head out to Okotoks for sushi. I visited Yokozuna once before Christmas and I’ve been wanting to take the family there ever since. I find the servers and chefs to be extraordinarily friendly, greeting customers ‘welcome’ in Japanese every time the door opens. For my first visit, I sat at the bar so that I could watch all the sushi action. I had an in depth discussion with the younger chef about the difference in various pickled ginger. Most places use a very ‘pink’ pickled ginger but Yokozuna uses one that has a more subtle flavour and colour. We both agreed we enjoyed the subtle ginger. He did shake his head at me when I told him that I am not a wasabi fan. This is the soft shell crab roll from my first visit. The crab was very generous but the rolls were really large and difficult to eat. That is not unusual for ‘spider rolls’. We arrived at the restaurant around 7:40pm and there were only two other tables occupied. I was disappointed to find out they no longer did the $1 sushi special on Mondays as advertised on their Facebook page. I knew that would greatly increase our bill! Usually I like to have sake with my sushi but since today was Monday my second choice was ginger ale. The menus are laminated and you use a dry erase marker to mark which dishes you would like to order. Points for being environmentally friendly. 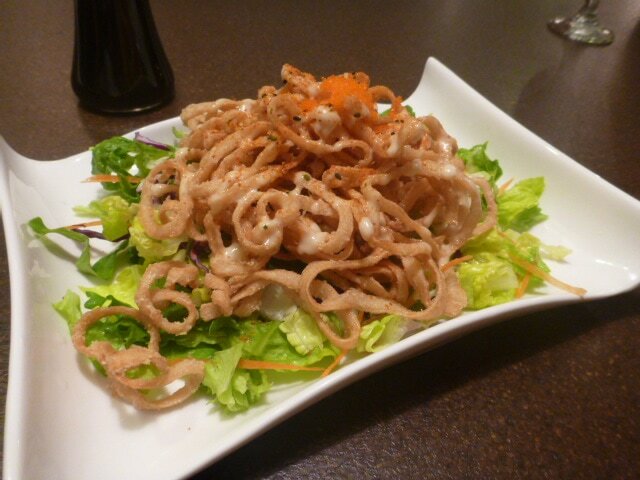 The Mentai Calamari was probably the favourite dish of the night. Very lightly battered calamari with a bit of spice and sweetness to it, set off by a light vinaigrette dressing. The kids liked the dressing so much, they ate the components all together, as intended! This dish was a definite order again. ‘Cherry Blossom’ was a HUGE plate of extra large sushi rolls (maki). They contained avocado and salmon with tuna on the outside. The centre rolls were topped with wakame (seaweed salad) and tobiko (flying fish roe). I think I had a love/hate relationship with the cream sauce because it was made with wasabe. Someone obviously did not read the menu thoroughly because she was too hungry. Fortunately the amount of wasabi in the sauce was just the right amount to give it a little kick without being too obvious. The flavours were so balanced that I had to try it a couple of times before I realized that spice hit was coming from the wasabi. I would probably even order it again, except the next time, I would choose the ‘smaller roll’ option. These were about the size of the palm of my hand and extremely difficult to eat as they fell apart very easily. The waitperson pointed out the smaller roll option AFTER we had finished eating. 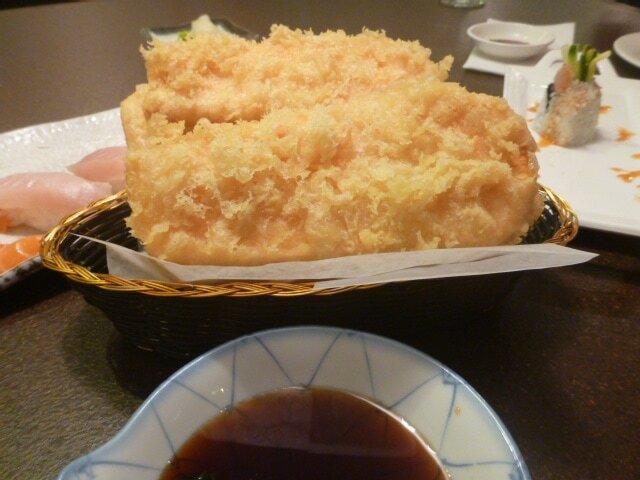 The Yam Tempura. Let me start by saying that I really think we got a whole yam with our order. We were blown away by how much yam was in the dish. Usually when you order tempura there’s a scramble for everyone to claim their piece but this order had us bursting a gut later on. I’m not sure what kind of a sauce you get with tempura but many times it is what I enjoy most about tempura. It was lightly fried and extremely crispy as tempura should be. 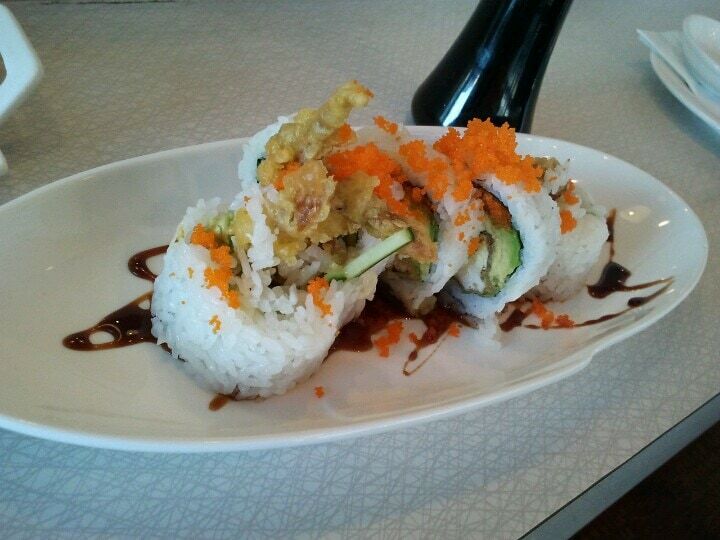 This Sushi Roll Combo was one of many combos you could order. 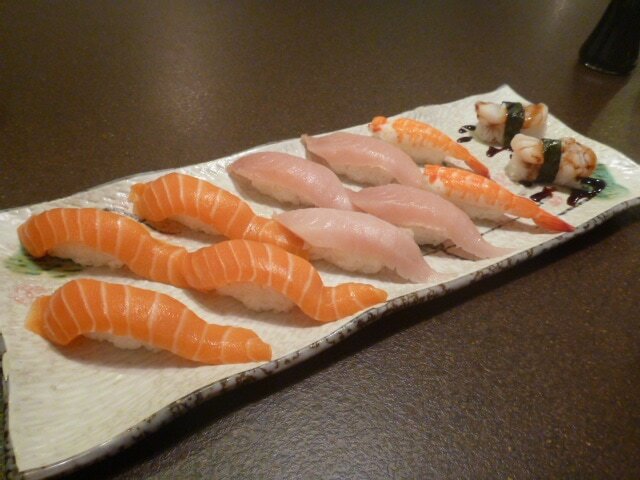 It included four Sake (Salmon), four Toro (Tuna), two Hotate (scallop) and two ebi (shrimp) nigiri. 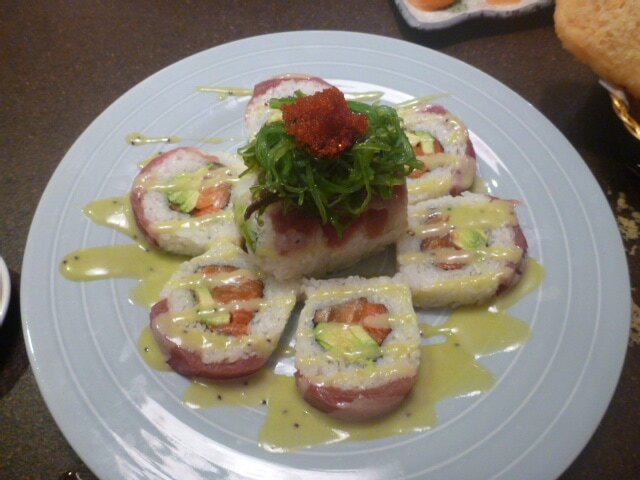 Included were also two maki, California and dynamite (not pictured). This was the first time I tried the scallops and I thought they were pretty good and was surprised that they were served slightly warmed. The cuts of salmon and tuna were huge! The sushi eating was a two bite operation. 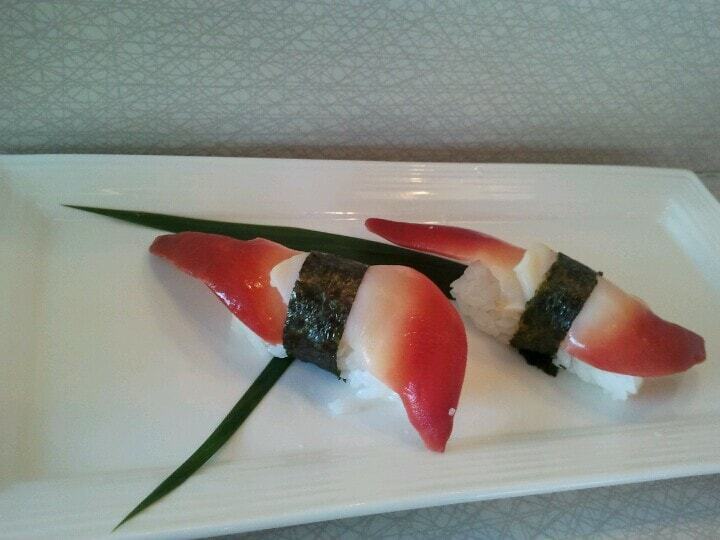 Last, but not least, were my favourite Hokkigai, or surf clam. It’s hard to explain my love for this nigiri sushi as it’s not really one of the popular choices and many restaurants don’t even carry it. 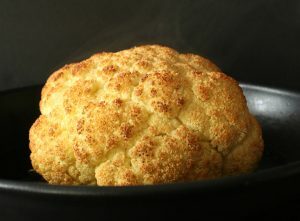 When it’s fresh, it is sweet with an amazing chewy texture. Yokozuna does Hokkigai right, two large pieces tied onto the rice with a strip of nori. A delicious little package.